15 May 2018–Scientists monitoring the vibrations of natural rock arches have found that the resonant frequencies of arches undergo dynamic changes from day to day, according to research presented at the 2018 SSA Annual Meeting. 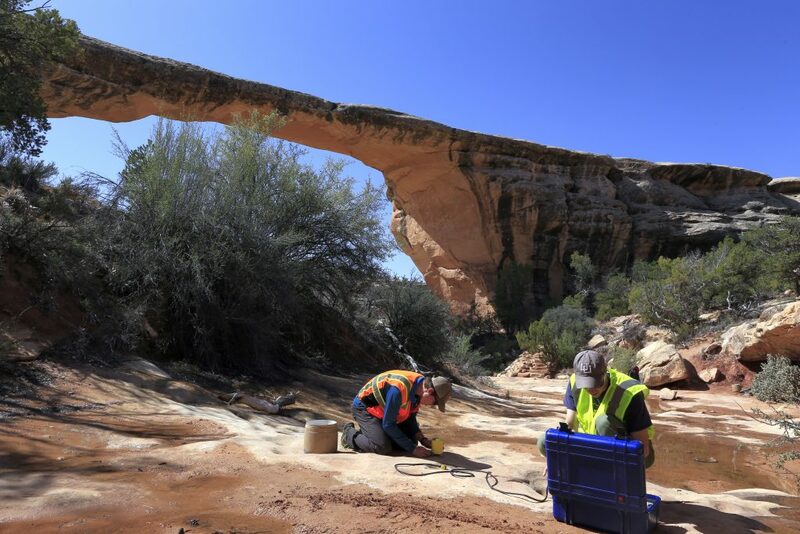 Geimer’s advisor University of Utah geoscientist Jeff Moore had also received a request from the National Park Service and Native American tribes worried about the future of Rainbow Bridge, where tourism helicopters fly over nearby Lake Powell. “They wanted to see if we could tell them more about the potential dangers from helicopters, and about the vibration levels that the bridge might be experiencing from these manmade sources,” Geimer said. “Vibration monitoring of man-made structures to detect and measure damage is a well-established technique within civil engineering, and now we’re able to apply many of the same methods to natural structures where we don’t have the same level of prior knowledge about the stability of the structure or material properties,” he noted. While these changes are likely acting to weaken the arch over time, the researchers haven’t yet been able to identify a frequency change that would indicate an imminent collapse of an arch. “We don’t believe that we have measured a site with significant enough changes to indicate failure—all variations measured to this point have been caused by temporary, recoverable changes to the rock,” said Geimer.